Recently, my friend Marilou announced that she cannot make quilts because she is clueless about colors. I argued with her, knowing that she is a pragmatic person, that quilts can be made from a functional standpoint, too, not just a color scheme or to match a decor. I've been reading lots of back-issues of Threads, given to me by Rebecca's aunt. I don't like to see quilting defined as a hobby requiring special tools, clubs, and matching fabric. People like Marilou and me get confused and give up. 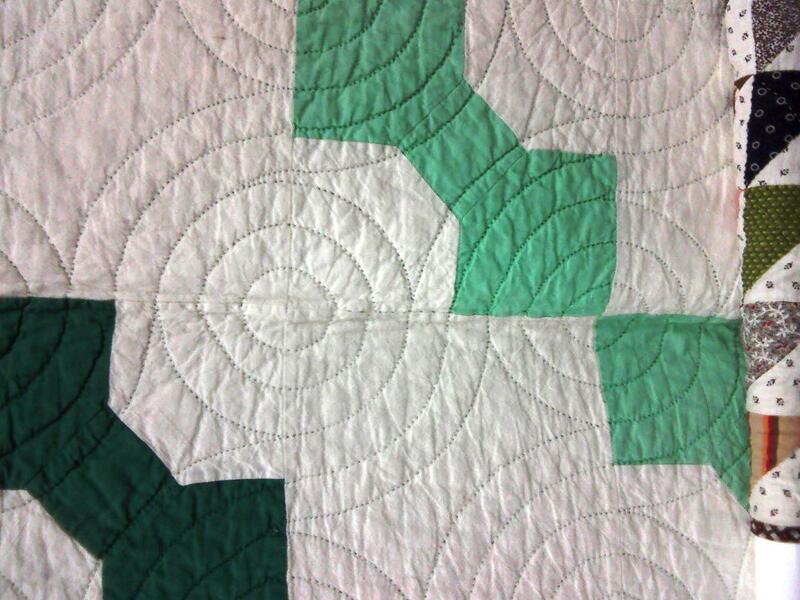 When I look at the Gee's Bend quilts or other African-American patchwork, I can work again with confidence. 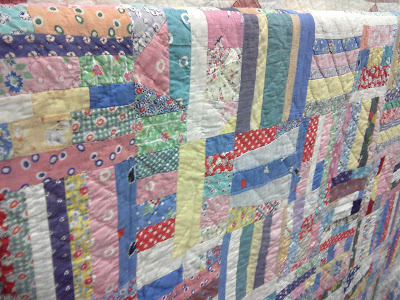 These quilts are so beautiful to my eye because the quilter was using what she had and making beauty within that. I can do that, too! I recognize this approach from my grandma and other Mennonite grandmothers. I can't imagine Grandma Weaver carrying around swatches to fabric stores to get exact matches in order to make a quilt to a color scheme. She used what people gave her or what she found in the second-hand shop where she worked. My sister has a weirdly beautiful yellow quilt to prove it. I admire the technical prowess in planned matched quilts with intricate quilting, but they do not move me. Whereas, when I see a quilt made from real odds and ends, my heart melts. I'm working on a wallhanging right now, something I swore I would never do because most quilted wallhangings I have seen are too cute or too clumsy. Either commit to a whole quilt or just hang a darn picture on the wall! 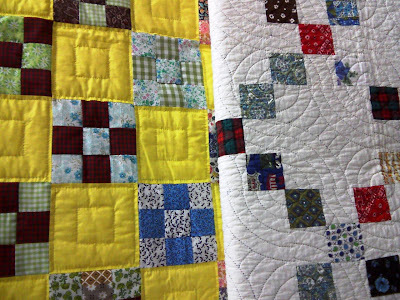 However, I acquired three orphan quilt blocks in the Mennonite-Grandma-Weaver style that needed to stand alone as art. I'm adding some stitching, embroidery actually. I'm eager to show them to you next week, after they accompany me on my travels for work. 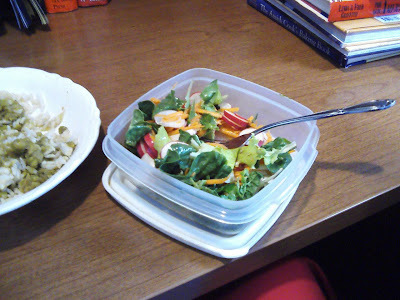 When I pack salad for a brown-bag refrigerated lunch, I don't dress it in the morning (it would be a disgusting slimy mess after a few hours). I don't put the dressing in a separate little container either (which usually leaks; plus, most of the dressing seems to stay in the container when I try to pour it out). Instead, I pour the right amount of dressing down into one corner of the plastic container I'm packing the salad in. At lunch, I just mix up the salad and dressing and hey presto! a crisp home salad for lunch. Is this a trick that everybody knows? It was a new thought to Rebecca, too, but maybe the world is made up of rolling epiphany waves and we're just on a different one from the rest of y'all. We have very few knick-knacks sitting around. They get dusty and I don't like to take the time to dust them. Plus, I think my husband would live in a modern cube if he had his way. However, I wanted to put up some family photos - family is so important to me. I recalled an idea in a Rosamund Pilcher novel that I read years ago. One of the characters lived in a very modern flat, very white and spare. She painted one narrow wall bright blue and hung all her family photos tightly on that wall. So that's what I'm doing at the base of our stairs, sans the blue. I add a family photo as I come across one we love. Me, my sister, and brother, early 1980s. I'm using clip frames, which I pick up every time I go past a craft store with a 40% off coupon - the small ones cost less than $2 that way. How do you handle family photos? It was such an elegant 1950s meal. I didn't intend to broil the steaks, but there was just enough gas left in the grill to turn it on and that was it, as I discovered just before dinner. I turned to my 1954 Joy of Cooking for help. I really have not been following recipes recently - only using them for ideas. What I did was heat the oven to 350, then turn the broiler on high. I laid the steaks on a rimmed baking sheet and broiled them for 5 minutes a side. They were tender and absolutely delicious. And so was the vichysoisse. I wasn't crazy about it last year - I hope I can repeat this version again. 1. Saute leeks in butter. 2. Add chopped potatoes, roughly the same quantity as leeks. Saute a little. (Peel the potatoes if you're after perfectly fleck-free soup). 3. Barely cover with good chicken stock. Cook covered until tender. Allow to cool (several hours). 4. Add some watercress. Blend until very smooth, adding some milk and plain yogurt, a little half and half. 5. Add some dill and marjoram. Taste, add salt. 7. Serve in soup bowls, garnished with snipped parsley. Lettuce from our garden, but not much longer: it's starting to bolt in the heat. By this point, my husband was saying firmly, "I'm hungry." So I put the camera away, despite the lovely light that comes in our dining room at lunchtime every day. And then we had a lovely Sunday dinner with naps and books to follow. Why didn't I realize that having my sewing machine set up all the time would make me whiz-bang projects out one after another? I used to sew at the dining room table - our only table - so I was constantly setting up or taking down my machine. Now, it's so efficient - I just run up to my machine, sew a few minutes, and run back to whatever. The birds are waking me up early now, and I can easily sew for a little bit while I sip my tea, turning off my machine whenever I hear roars from the children. I took an old eyelet dresser scarf and turned it into a catch-all in the laundry room. Now the hankies and napkins have a decent place to wait for Genevieve, instead of handfuls hanging off the ironing board holder. Then I took the best scraps from that project and made little soap totes for my etsy shop. More to come - they're so fun to make. I felt a desire to sew something with ball fringe. I used my 40% off coupon to go to Jo-Ann's and buy 2 yards. I was in the store for 5 minutes and that was the only thing I bought. Shopping with littles taught me that method of shopping. I'm sure the stores are very disappointed with my non-impulse shopping (or maybe this ball-fringe thing was an impulse. . . ). Then I was moved to make a summer pillow cover for one of our sofa cushions. I really am not a seasonal decorator because I have no idea where I would store the off-season stuff; ergo, the "winter" pillow cover is washed and hanging out in the laundry basket until I figure out what to do with it. The fabric for this pillow cover is from a thrifted, stained tablecloth. I avoided the stains. I also got to sew this with a girlfriend at her house after all our respective children were in bed. Lovely. The pillow cover is very popular with the children, whom I have threatened with evil things if one of the balls is pinched off or sucked on or something else I couldn't dream up. A Preface: My family is not terribly keen on rhubarb, but it is local, healthy, and cheap. It will be making an appearance on our table. No one is allowed to complain, but no one chooses rhubarb for their birthday meal. I recently discovered that the apples I had been buying all winter were not local since January. And the potatoes that I thought came from a local farm, had been shipped in from California until the local potatoes are ready in two weeks. Unfortunately, both products were presented in a way that made me think they were local. I think it's fine to ship food within reason (I love lemons, for example), but I am very firmly against lack of information and the sense of entitlement to any food in any season. Hence, it seems reasonable to me to eat rhubarb and strawberries right now. 1. Chop 1 pound of rhubarb into rough 1-2" pieces. Place in casserole. 2. Pour in 1/4 or 1/3 cup sugar. Cover. 3. Bake at whatever temperature your other stuff is baking, for about 20-30 minutes. The rhubarb should be completely soft, some of it dissolved into shreds. It is not attractive. 5. Serve warm or chilled, just as you would applesauce. And if you like to jazz up applesauce with ginger or cinnamon or something, you could probably do that here too. Or serve as a sauce over dessert biscuit or tapioca. I served it for breakfast with a new variation of baked oatmeal that I am in love with. I cut the sugar back even more, axed the cinnamon, and added a smidge of vanilla. The idea came from Marilou's Favorite Oatmeal Cookies. For simplicity's sake, I'll just re-type the oatmeal recipe here. Pour in 3 c. quick oatmeal (I use part rolled oats). Pour liquids in on top, mix evenly. Serve warm with milk, yogurt, applesauce, or saucy fruit. I always let my bars of soap dry out and harden for a while before I use them. Suddenly last week (my new room has unleashed lots of ideas), I thought I could let them scent the closets while they do that. I whipped up several little net bags with ribbon handles. I put a bar of soap in each one and hung them in my closets. Is this not genius? My soap gets dry, the closets smell nice, and there is no musty, used-up dried sachet to throw away. I am so pleased. Genevieve's first day of preschool calico dress was getting too short; I only put in a 1" hem. When I let it out, there was a white faded line. Drat. I made a tube of the green calico, ironed it flat with the seam in the middle back, and topstitched it down over the faded line. Then I added a wide ruffle at the bottom. We'll see how many years we get out of it. The fresh calico is just a tiny bit brighter than the dress, but you have to really study the dress to notice. Last spring, Genevieve was wearing this dress when I took pictures of the first strawberries. We had our first strawberries last week. First we ate them with lemon chiffon pudding, then we had dessert biscuit, strawberries, and homemade ice cream. We are just getting started on this happy season! Spaghetti topped with pan-roasted asparagus, sunny-side-up egg, freshly ground pepper and salt, and lots of freshly grated Parmesan. Break the egg to mix it up into a glorious sauce. Delicious. And there was a green salad, too, with lettuce from our garden. We're eating it as fast as we can so we can plant green beans in that spot. It's a lovely homecoming meal after a long day at my job. Sugar is not a flavor – it brings out flavors that are already there, or should be there. I like sweets, but I like flavors first. I've been thinking about that when I cook and bake. Rebecca and I have talking about this too, in light of the recent sugar intake guidelines. I like the contrast of something sweet with something less sweet. For example, I made Pan Eclairs for my sister's birthday recently. The eggy crust has no sugar. Then the creamy part is moderately sweet. I added only a smidge of sugar to the whipping cream on top of that, but the final layer of ganache is decadently rich and sweet. Do you control sugar in your diet? How? And brushing one less tooth! My big girl lost her first tooth in a casual way at school (surprising, because there was a lot of drama up to this point). She's wearing a new nightie that I sewed for her. I used this pattern again, and the cherry one still fits her as her other summer nightie. I adore this story fabric so much that I was almost paralyzed about cutting and sewing it. But my fabric stash feels large right now, so I told myself this was a great way to sew it down. If she keeps growing up like a string-bean, the nightie should be just fine into high school. It's the electric clock of my childhood kitchen, where its cord was tucked behind it out of sight. But in my little workroom, there was nowhere to hide the cord. So I hid it with a patchwork tube, sewn together at 11pm one night in a very happy burst of creativity. It's the fastest sewing ever, with raw seams and purple thread. I love it. It makes me happy. Daisies have always been special to me. My little room is coming along nicely. I did my first sewing in this space yesterday, Mother's Day. Lovely. Linking up with No Minimalist Here, DIY Show-off, and Nifty Thrifty.